Great job as always! I love the summery colors! I love it when you get urges to wall smth! Well this looks perfect <3 No changes but I love it <3 better than the original! Summer walls in winter FTW! I love the way you did their eyes, very detailed and nicely brought to life. Oh my gosh I love this scan and for you to redo this is amazing. I love how you did their hair and eyes and such detail in them and the shading on them is awesome and the clouds and ocean look so real looking. Im just still so amazed I mean they look so real looking it looks even better than a art book picture. yet calm. I agree with Kitten for the eyes, they are so detailed yet soft, i really love it! Awesome job on this, I love that you changed the theme from day to sunrise. The clouds are so puffy and well painted, I really like this. The next excellent work! I must say then this wall is better then the scan. When I must choose between the scan and your work, I definitely choose your work! Lines are clean and neat, beautiful shadown and color of the hair.......Very good job! and their eyes are are too dark--try adding some yellow-ish shades to ease the transition between gray and white. same with the highlights ont heir clothes, more yellows and purples would really bring out the scene. good job though and i always loved this scan. Am not a big fan of Bleach but this wp has been greatly done! The sunset colors renders the scene more romantic imo. Great Job! i needed some awesome bleach wall after reading vol 38, and as if by fate you submitted this! thanks so much! This is great~~!I prefer the sunset than the original vers.Thanks for sharing~! Great job! Love this one. 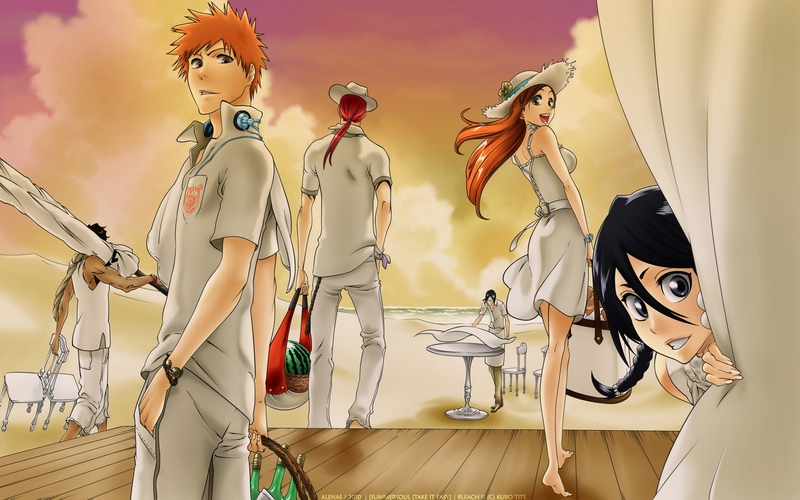 i really like it,the colours of the sky are great and i like rukia's look..